The immigration offices in Pattaya is well known to most expats. We have listed the address and telephone numbers for the Thai Immigration office in Pattaya so you can call them before you visit them. You may also visit them at the address listed below. 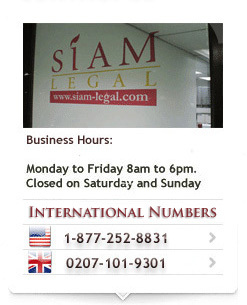 Note the operating hours of the immigration office in Jomtien, Pattaya. If you wish to speak to someone about an immigration issue or the extending of your retirement visa or marriage visa then you can call our office in Pattaya or you may wish to speak to immigration yourself while in Pattaya. If you are on overstay, take good advice and contact our office first and allow us to contact Thai immigration for you in Pattaya. Deportation and arrest can and will be very traumatic but we can ensure that the process is much smoother and faster. Hello, will immigration office be open as normal next week? Thank you very much. There have not been any announcements from the Thai authorities whether there is a holiday for the week of October 17. Kindly await an official report from the Thai government. You may also call your local immigration office to confirm. I would like to stay in Pattaya for three months. I’m on a British passport can anybody help? You may apply for a 60-day tourist visa from the Thai embassy or consulate in your​ country of residence. Once you arrive in Thailand, you can apply for a 30-day extension from the immigration office in Pattaya. Hello. I’m on vacation in Thailand and seem to have lost my stamped Thai arrival card. Still have my departure card and of course my passport with my visa. I had my card when I checked into my current hotel. Will I need to get a new arrival card if I want to change hotels? Normally, the arrival card is taken by the officer at the immigration checkpoint upon arrival in Thailand. It is more crucial that you have your departure card since you will need to present this to the immigration officer before you exit Thailand. I will come to Thailand for one month. I’m Russian passport holder, so I don’t need visa for 30 days. Can I apply for extension in Pattaya for extra 7 days? Yes, you can apply for an extension of the 30-day entry stamp at the immigration office in Pattaya. I’d like to extend my visa by 30 days. Could you please let me know if I apply for the new visa a few days before the current one expires? Does the 30-day extension date run from the end of the current 30-day visa or from the day of approved application extension? You can apply for the extension any time before your current stamp runs out. It is better to apply as early as possible since the 30-day extension will ​​run from the end of your current 30-day stamp. How much is the thirty day extension visa cost? The visa extension costs 1,900THB. I have a valid Immigration type O visa valid unit March 2017. I am German female and born 09.05.19XX. I receive German pension already. Can it be changed into a retirement visa Non Immigrant O-A in Pattaya? What documents are needed? Kindly get in touch with the Pattaya immigration office to inquire about applying for the retirement visa extension. My 90 days report is due on November 13th which is a Sunday. If immigration is closed, on Monday November 14 do I have to pay overstay? You are still given a 7-day period after your report is due to visit the immigration office for your 90-day report before you are charged a fine for late reporting. My retirement visa expires on a Saturday. Can I renew it on the following Monday? You need to renew your retirement visa within 30 days before it expires. If you wait until after it expires, you would have to start a new application since the visa has already expired. Hi, I arrived to to Pattaya (via Bangkok airport) last Saturday. I put my departure card inside my passport but now I noticed that it is not there. I have only the passport and the boarding pass of the flight. I am leaving Thailand at the 19th of October. Should I visit you or how can I get the card? I understand that the card is needed when I leave the country. I am living in a hotel in Pattaya. You may visit your local immigration office to obtain a departure card. Hello, I arrived in Pattaya on October 18 and I will leave on November 17. When I arrived at the Bangkok airport I told them I was leaving on November 17, but they stamped my passport to leave on November 16. Will I need an extension for the extra day? Should you wish to avoid paying the overstay fine of 500THB per day, you may apply for a visa extension at an immigration office near your current location.